The Australian Institute of Health and Welfare (AIHW) has reported that almost a quarter of a million people sought assistance for homelessness during the 2012 financial year. That’s one in every 98 Australians, enough to fill the ANZ stadium three times. More than half of these people were women. “Women quite often find themselves in the margins … in the popular perception of what homelessness looks like, but they’re every bit as represented in the statistics,” said Chris Povey, principle lawyer and manager of the Homeless Persons Legal Clinic. Getting exact statistics is difficult — those sleeping rough go uncounted and the ABS admits that women’s refuges are often misclassified as private dwellings during the census. The AIHW has found a better way of estimating — by asking service providers to submit counts of their clients. Using this method, AIHW found about 19,000 people slept in a government-supported accommodation each night during the 2011-12 financial year. Mi Fon Lew, from the Women’s Information and Referral Exchange (WIRE) told New Matilda that last year, 84,000 women were counted in the AIHW survey. “And that’s the women receiving support. You’re not including the other women who are couch surfing, living with friends, sleeping in cars and not accessing these services,” Lew added. 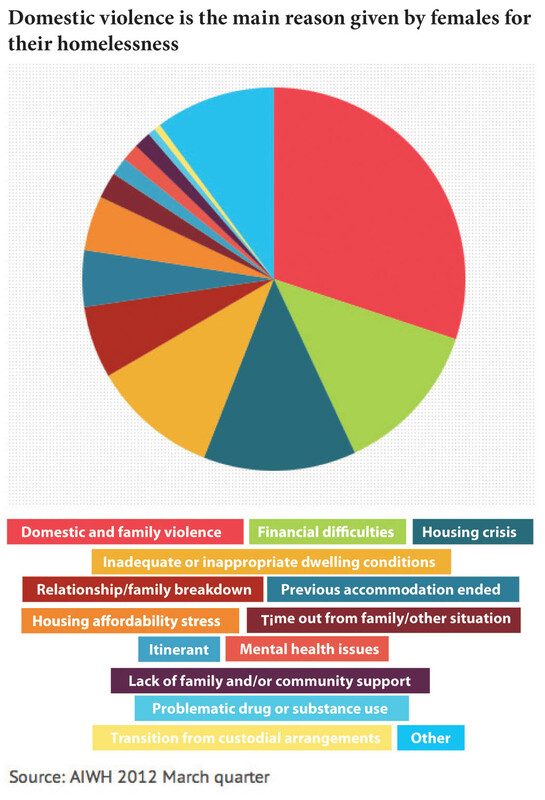 Just over half of women with children entering emergency housing cite “domestic violence” as their main reason for becoming homeless. So do more than a third of young women with no children. The AIWH 2012 report states that women and children become temporarily homeless for domestic violence reasons, but wonders if the decline in the housing market explains the increase in long-term homelessness. That’s the AIWH theory on why homelessness increased on census night. Interestingly, the Federal Government’s background paper to “Time for Action” states that reports of sexual assault have increased by an average of 4 per cent each year since 1995. Although there is no proof of correlation, that is strikingly close to the 5 per cent per annum increase in homelessness between 2006 and 2011. Regardless of the increase, with the exception of very young children, homeless females are the ones bearing the brunt of domestic violence. Not only are more homeless women victims of violence, but more victims of violence become homeless. According to the Women’s Property Initiative, more than one out of every five incidences of domestic violence leads to homelessness. Aside from domestic violence, there is another issue surrounding women and homelessness. Namely, that a wide variety of marginalised groups are disproportionately women. For example, the Federal Government white paper on homelessness, The Road Home, explains that young people aged 12 to 18 are the largest group of people experiencing homelessness. Of young people who turn up alone at services, 63 per cent are female. Females are also a greater proportion of rural clients. While females represent 57 per cent of clients in cities, they represent 81 per cent of clients in very remote areas. Three out of five Indigenous homeless clients are female. WIRE is seeing a growing number of older women who find themselves homeless. These women have brought up families, taken a break in their careers, and then suddenly find themselves alone, without a home and unable to support themselves. “We’re finding that all the other structural inequalities that affect women on a day to day basis that contribute to housing crises that women face when they grow older,” Lew said. By this time last year, the AIHW figures were showing a disturbing trend for Victoria. “Even if the woman fulfills all the criteria that makes her eligible for crises or emergency housing, one in two are turned away because there just aren’t enough beds,” Lew said. “Housing crises and homelessness is a growing issue with the women who contact us … We even get calls from housing workers who are at a loss as to where to direct clients,” she added. In response to this demand WIRE has recently produced a comprehensive information booklet to provide support for women facing housing crises in Victoria. But the booklet’s popularity brings little joy to the staff. “The reality is there’s just not very much housing out there,” Lew said. Nationwide, nearly one-fifth of clients (19 per cent) had a need for emergency accommodation that was unmet. In Victoria, where the situation is particularly bad, there are over 37,000 people on the waiting list for public housing — many pushed into precarious circumstances by otherwise minor events. Internationally, there are examples of successful programs. Povey, who received Churchill Trust support to study homeless interventions abroad, found programs like the UK’s Family Intervention Projects to be highly successful. These programs emphasise low case numbers, comprehensive support, strong relationships, and they do not have an “expiry date”. They target longer-lasting, preventative interventions. Back in Australia, there is momentum for improving this situation. The Federal Government has released a draft bill aimed at increasing recognition and awareness of people who are experiencing or at risk of homelessness. In addition to increasing awareness of the problem, the draft bill will set out a range of service delivery principles and strategies the Commonwealth regards as necessary to reduce homelessness. Submissions can be emailed to homelessnesslegislation@fahcsia.gov.au. Perhaps by the next International Women’s Day, the statistics will be less grim.